Aubusson is a town on the Creuse River in central France. 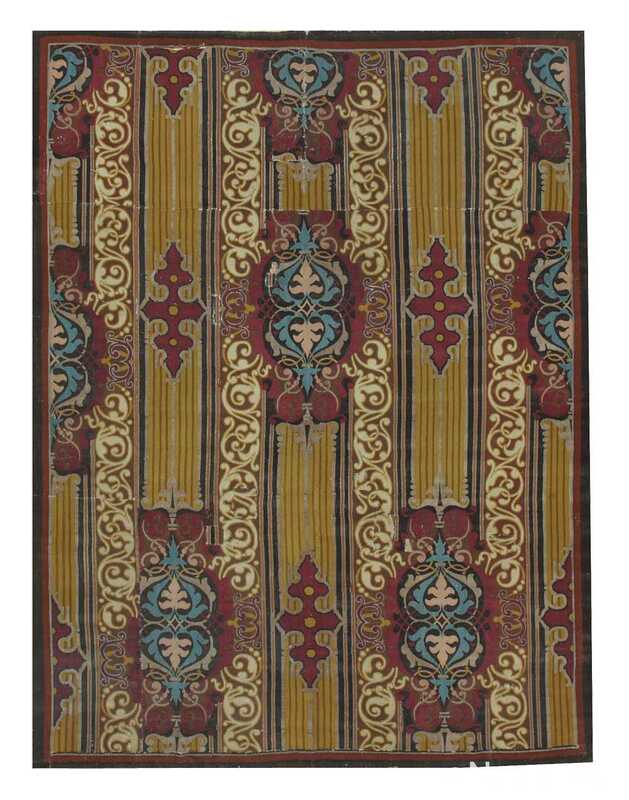 It has been famed for its carpets as well as Tapestries since the 15th century. 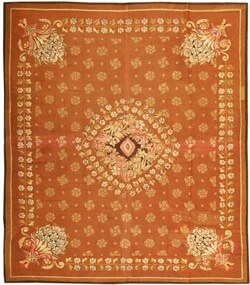 Antique Aubusson rugs made in tapestry technique are among the most elegant and luxurious antique floor coverings. The true date when the production of flat woven tapestry Aubusson carpets in France began is not known. 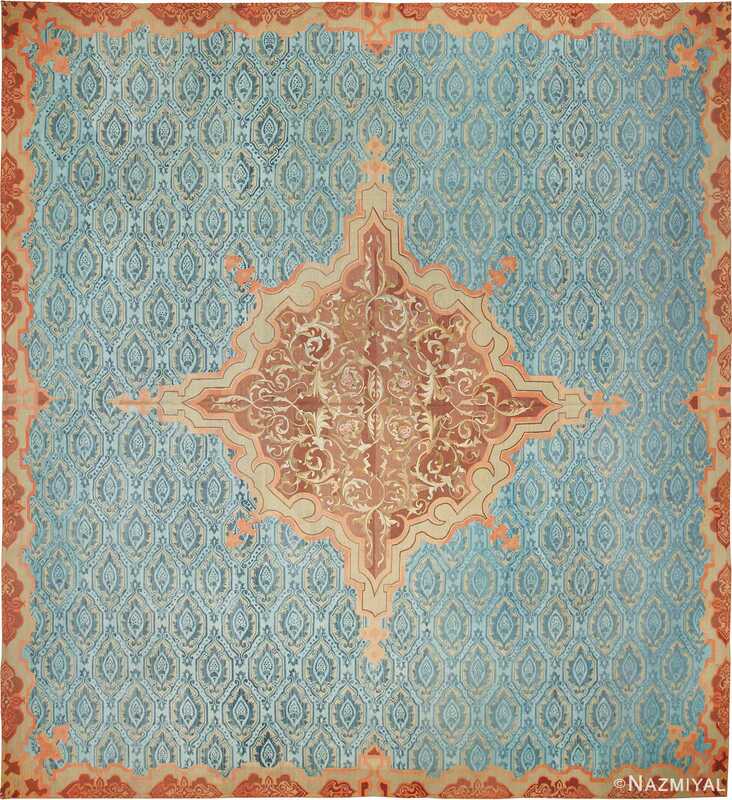 With that said, examples of Aubusson carpets with Rococo designs have led most of us in the field to speculate that it probably began in during the mid 18th century when the taste for Oriental rugs started to shift in favor of European design. We do know that Louis the XV, Louis the XVI and Napoleon the I had all ordered flat woven Aubusson rugs (the latter two ordering far more than the former). A 1786 inventory lists more than one hundred Aubusson carpets at the palace of Versailles and a 1789 inventory of all royal palaces describes a great many more. The fact that Aubusson rugs were easier to manufacture is the leading reason why so many rugs from this manufacturer were ordered by the aristocracy for their castles and chateaux enabling them to custom make rugs for unusually large spaces in a fraction of the time it would take to weave in pile (all the time maintaining the beauty, grace, elegance and aesthetic appeal which was demanded by the ruling class at the time). With their grand designs of frames and cartouches hung with garlands, they have a clear, Neoclassical almost architectural and soft coloration reminiscent of Greco-Roman decorative arts. These qualities still establish Aubusson rugs as one of the more effective alternatives in traditional interior decor. 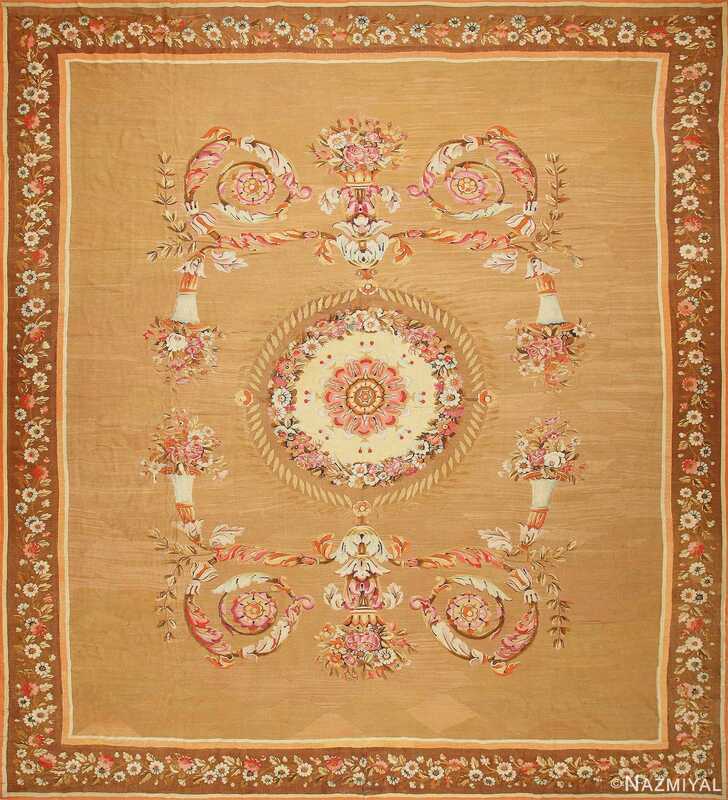 French Aubusson rugs are rich in history and armed with a timeless appeal. 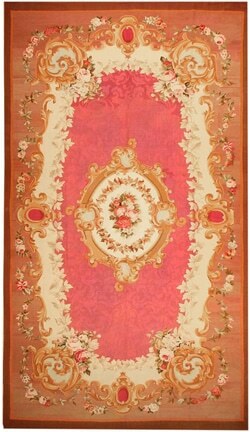 Antique Aubusson carpets been sought after by the leading interior designers as well as consumers for decades. As a side note, the fact that these rugs were commissioned for and by the aristocracy explains why they are far more abundant in larger sizes, more so than any other type of rug. To elaborate, Aubussons are rarely found in smaller “scatter” sizes, the ruling class always desired to convey an impression of grandness, so rather than splitting up the room with a number of smaller pieces, they opted to fill the entire room, to be viewed not only as a decorative floor covering, but rather as a grand and graceful work of art to be admired by all who enter. 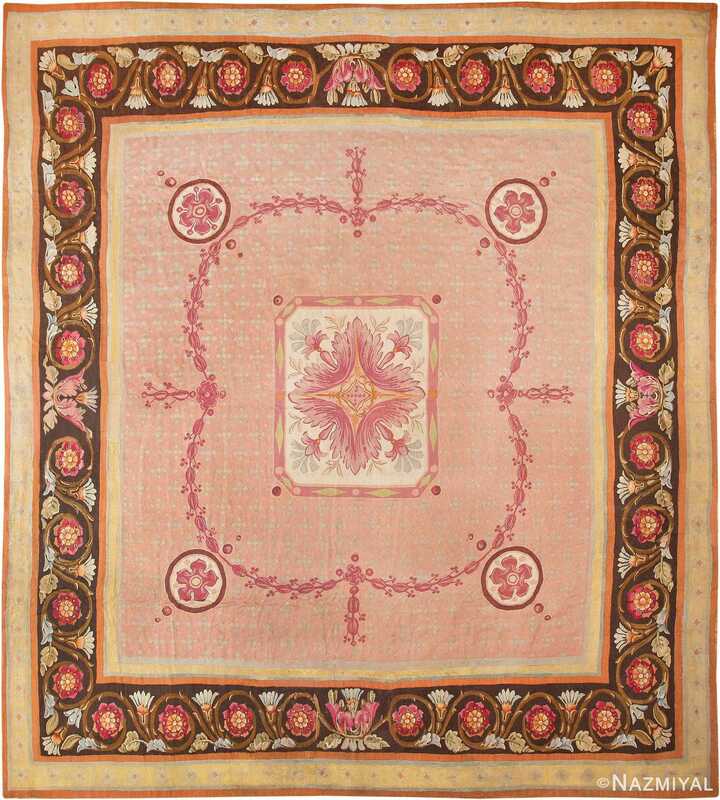 The aristocratic style of Aubusson rugs is like no other in France, Europe or the greater carpet-producing world. Like the most successful carpet production systems, France’s great looms were established to serve the country’s aristocratic leaders. Based on royal trends, designers painstakingly fashioned elegant flat-weave tapestry carpets that rivaled the opulent architectural style of Versailles. 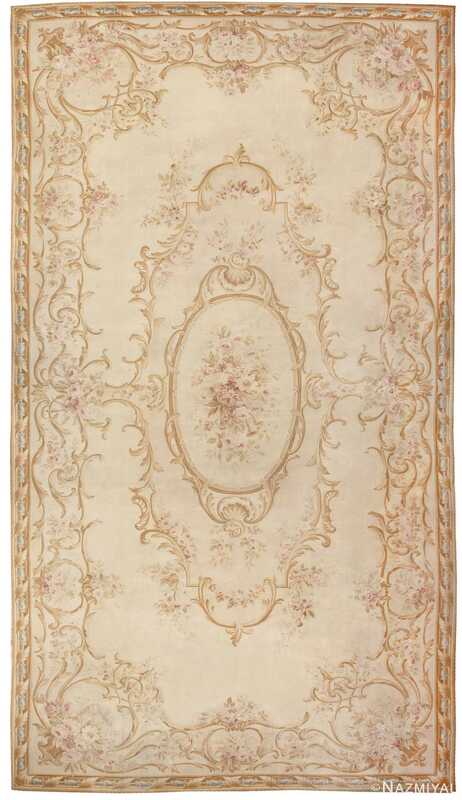 Using scrolling acanthus leaves and lush cabbage rose bouquets, skillful designers in Aubusson crafted elegant French carpets that perfectly complemented the baroque style of the time. 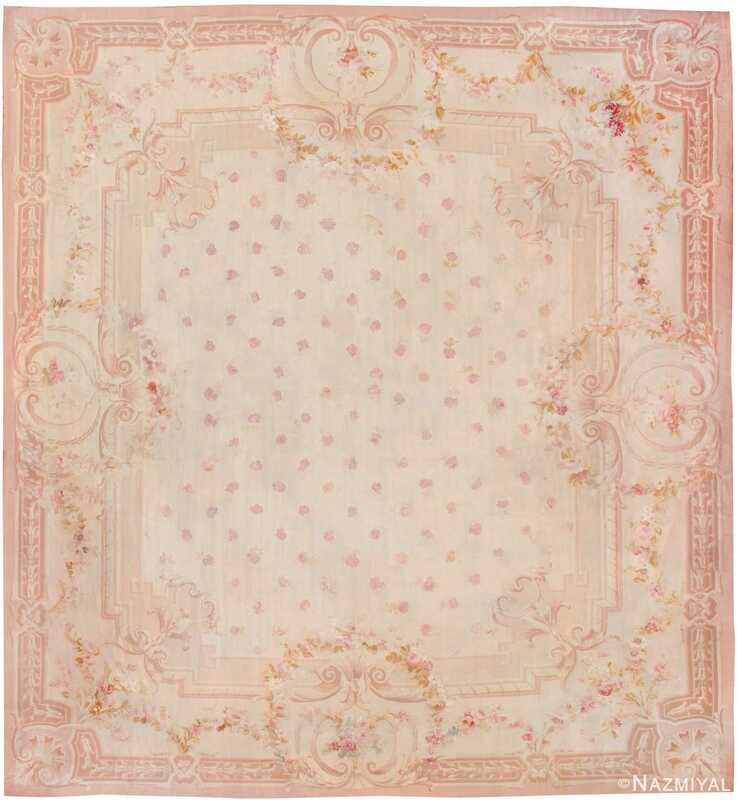 The romantic pastel colors, architectural designs and floriferous style of Aubusson rugs are still appreciated by today’s top designers and celebrities. The general admiration for the lavish neoclassical style of Aubusson rugs has been continued by Coco Chanel, Tory Burch and the Kennedy’s. While the very idea of woven decorative floor covering is virtually synonymous with the Oriental rugs, rugs have also been produced in Europe and the Americas for centuries. 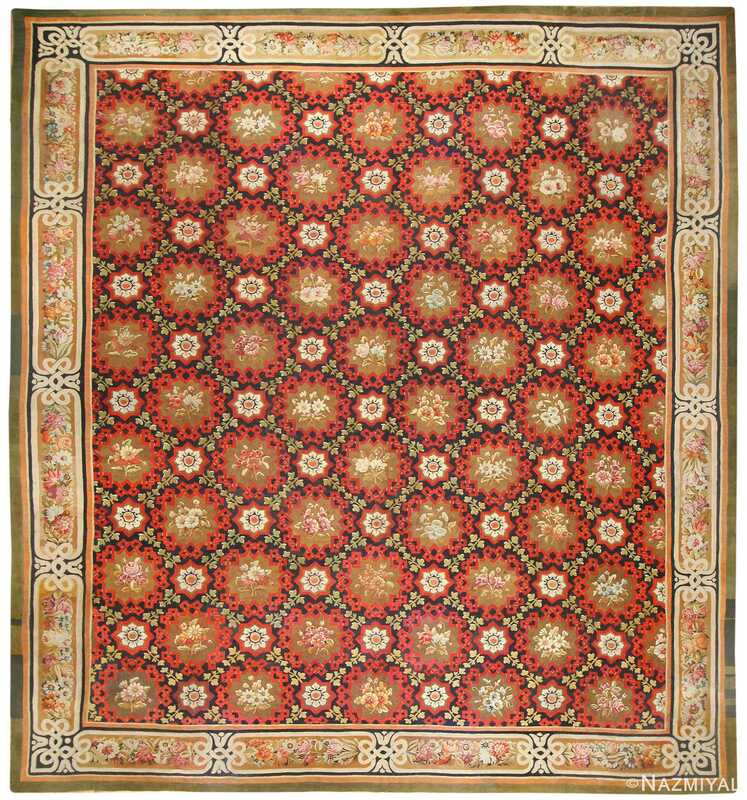 The foremost productions of this kind in Europe were the Aubusson rugs and the pile carpets of the Savonnerie manufactury of the eighteenth century, which virtually eclipsed the European taste for Oriental rugs until the 1880’s. For most of the twentieth century, however, circumstances were once again reversed. 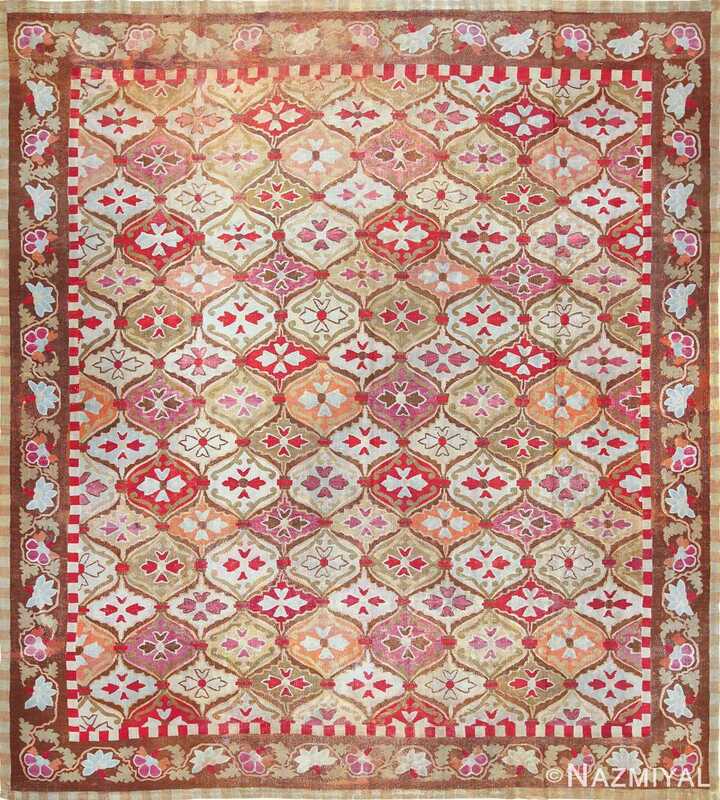 Aubusson and Savonnerie carpets, and their English cousins, the Axminsters, lived in the shadow of Oriental carpets, although they continued to maintain a certain market niche. Aubussons became the quintessential symbol of traditional European décor. For those who still enjoyed the great period styles of Louis XV or Louis XVI, or their neo-classical successors, First and Second Empire, and English Chippendale, nothing could pull a room together more effectively than an Aubusson or a Savonneriet. Consequently, Aubusson, Savonnerie, and Axminster carpets tend to be associated with old fashioned, conservative taste. But truly great carpets, like all great works of art, transcend the immediate circumstances that created them. Oriental carpets are the product of Islamic art, yet they have long been treasured as vital components in western European interiors. And no westerner who owns an Oriental carpet feels compelled to accompany it with Persian metal tableware and lamps or Moroccan inlaid furniture. Instead we combine antique Oriental rugs freely with western furnishings of all types, periods, and styles. So why then have Aubusson and kindred European carpets become period decorative pieces considered inseparable from some hidebound notion of neoclassical conservatism? The answer is simply that we have come habitually to think of them that way, when in fact Aubussons are remarkably adaptive to a range of modern or contemporary uses. From the standpoint of color alone, this is eminently clear. Aubussons tend toward a dominant cream, bone, or light tan ground, with darker colors like deep tan or browns limited to outlines. Larger swaths of color are confined to cool hues such as tan, rose-magenta, or mauve. Much of their effect is the same sort of tone-on-tone approach so cherished by contemporary interior designers. Some Aubussons have monumental, almost architectural designs with grand moldings, frames, and baroque cartouches. But these qualities are always mollified or offset by the neutral, restrained palette, and the use of open, quiescent, undecorated spaces. It is perhaps the graphic flourish of scrolls and vines in Aubussons that seems antique and old fashioned by today’s standards. Or perhaps the degree of floral or vegetative naturalism they utilize seems too lifelike for a modern sensibility focused on geometric abstraction. But modern architecture and interior design have today achieved a Post-modern aesthetic that transcends such constraining categorizations. Classicism has been deconstructed and re-examined to expose new potentials and possibilities. Classical works or elements can be quoted and re-contextualized within a modern ambiance. 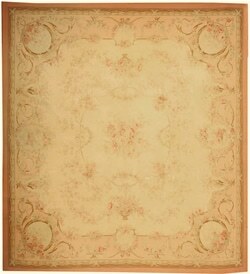 Aubusson carpets no longer require Louis XVI or Empire furnishings as accompaniments. Rather, it is exciting to explore how effectively such carpets may complement a range of twentieth-century modern and contemporary styles, especially those that utilize curve-linear design elements. The results are novel and surprising, demonstrating once again how much is possible if one can simply abandon the burden of habitual opinions and preconceptions.